FEATURE — What happens when “No Filter Show” co-hosts Paul Ford and Grady Sinclair go fishing for largemouth bass at Sand Hollow Reservoir at Sand Hollow State Park? Let’s just say things don’t end well for one of them when their big-mouth betting ways get them in trouble. Curious? Join Ford and Sinclair as they angle their way across the lake in search of some great fish tales. Sand Hollow Reservoir began filling in 2002 and was opened to fishing in 2004. Largemouth bass ranging from 8-16 inches in length are extremely abundant in the reservoir, according to Utah Division of Wildlife Resources. A fair amount of largemouth bass weighing 5 pounds or more also live in the reservoir making Sand Hollow one of the best places for bass fishing in the state. Fishing regulations allow anglers to harvest up to 6 largemouth bass with only one fish over 12 inches. Other species of fish that can be found in Sand Hollow Reservoir include bluegills and bullhead catfish. 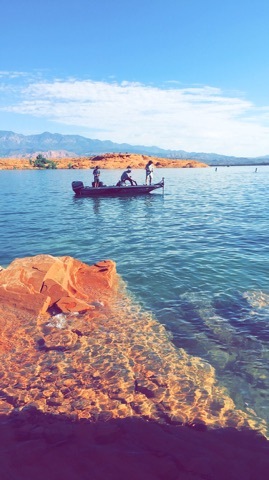 Sand Hollow Reservoir is an ideal place for beginning fishermen and is accessible almost all year round. State park fees apply and the only access to Sand Hollow Reservoir is through the Sand Hollow State Park entrance. Anglers must follow all statewide fishing regulations and licensing procedures as well as all state park rules and regulations. The 2017 Utah Fishing Guidebook can be found here. I seen the man who walks on water, very brief, but he was there.